Purdue University graduate student Valeria Mijares gives a presentation at a table topic rotation on research about the comprehensive indicators of water quality. Seated from left are Sherry Martin, research associate, Michigan State University, Danielle Gerlach, Michigan Sea Grant intern, Mary Bohling, extension educator, Michigan Sea Grant, Dan Walker, and Brian Miller. 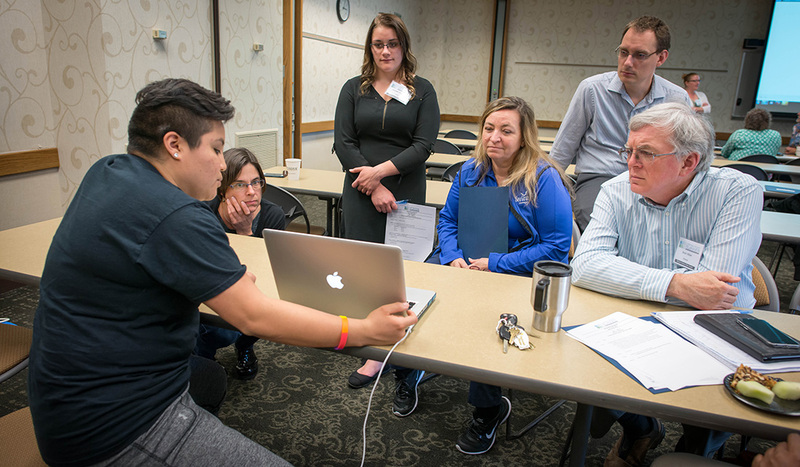 Researchers, federal and state government and non-government officials, students, and representatives from Ohio, Wisconsin, and Michigan Sea Grants gathered at Purdue University recently to take part in the two-day Tipping Point Planner collaboration workshop. Planners can also test how developing more in one location or restoring habitats in another moves ecosystems closer to or further from tipping points. With help from a Sea Grant facilitator, planners can use these interactive maps and simulators—along with recommended policies, ordinances, and outreach efforts—to prevent aquatic ecosystems from being degraded beyond repair. The program’s name is shorter and the homepage has a new look, but the goals for this powerful watershed-planning tool are the same. Some of those in attendance were part of the original team that helped get the program off the ground in 2010 and others were using it for the first time. The purpose of this workshop was to gather researchers and end-users of this decision-support system as well as partner government agencies to take part in feedback sessions to help inform the development of the upcoming redesign of the Tipping Point Planner website. Kara Salazar, IISG sustainable communities outreach specialist, has helped communities since 2012 learn how to use Tipping Point Planner in their area. Now Salazar, along with Dan Walker, community planning specialist and Lydia Utley, data analyst, are continuing to expand the tool’s use and functionality. “Communities plan for many reasons. The Tipping Point Planner process can support a community’s vision for managing land use while minimizing impacts on water quality,” Salazar said. 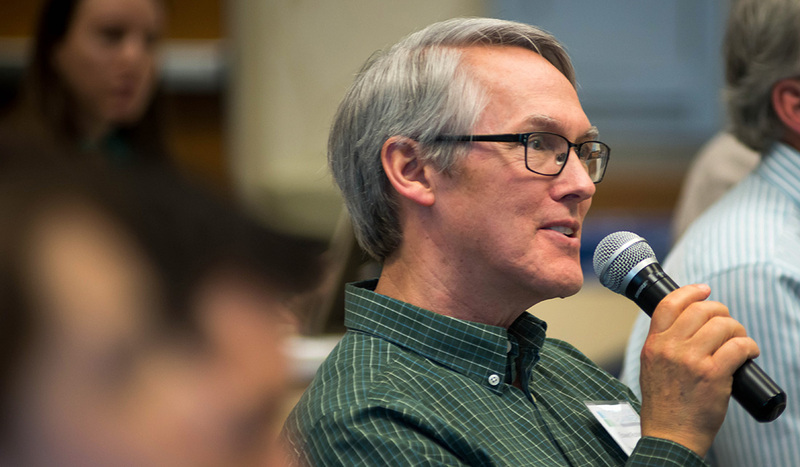 The first day of the workshop featured talks from researchers from the Great Lakes region followed by breakout sessions led by Purdue researchers on emerging issues. The second day addressed nutrients and food webs, new topics to the Tipping Point Planner tool. 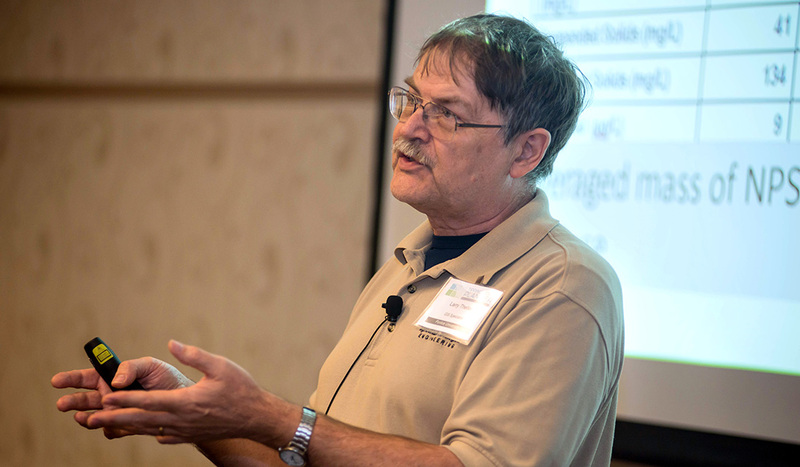 Larry Theller of Purdue gives a talk on “L-THIA works inside Tipping Point Planner.” L-THIA was developed as a straightforward analysis tool to provide estimates of changes in runoff, recharge, and nonpoint source pollution resulting from past or proposed land use changes. Chelsea Cottingham, watershed specialist at the Indiana Department of Environmental Management sees Tipping Point Planner as a tool for groups she works with that are in the early stages of the land-use planning process. The watershed she manages in northwest Indiana includes agriculture and urban land. Joe Lucente, Ohio Sea Grant, extension educator, community development, has been involved with Tipping Point Planner from the beginning. Much of his work with communities focuses on economic development and sees how Tipping Point Planner can help. To address that need for more specialized land-use needs, developers of the tool are working to make its calculations more exact to an area. Edward Rutherford, a fishery biologist at NOAA in Michigan, asks a question during the researcher presentation portion of the workshop. “It’s still at a watershed basis. We’re making it more goal specific so when a community begins the planning process for a specific topic or goal, we’ll be able to more effectively streamline them through the process,” Salazar said. Tipping Point Planner was developed in collaboration with Purdue University, University of Michigan, Michigan State University, University of Minnesota Duluth, University of Windsor, the Great Lakes Environmental Research Laboratory, the Cooperative Institute for Limnology and Ecosystem Research, the Great Lakes Restoration Initiative, NOAA, and the Great Lakes Sea Grant Network. Funding for the four-year project comes from NOAA and EPA.